The Italian Court of Como recently issued an interesting ruling in a homicide case. The ruling attracted national and international attention, because both brain imaging and genetic testing were admitted in Court as evidence of the defendant’s lack of competency. There are very few cases in the world in which this type of evidence was ruled admissible. In Italy, there are two precedents, both cases of murder. The speakers will discuss the Como case extensively and the two earlier cases in brief, and focus on a crucial question that emerged from the trials: the problem of ‘objectivity’ in competency assessments and the role of neuroscientific data in the assessment. The first speaker is Amedeo Santosuosso, Judge at the Court of Appeals of Milan and Professor of Law, Science and New Technologies at the University of Pavia. His talk will be followed by talks by Giuseppe Sartori, Professor of Neuropsychology at the University of Padua, and Pietro Pietrini, Professor of Clinical Biochemistry and Molecular Biology at the University of Pisa. Sartori and Pietrini are the authors of the competency expert reports in the Como case and in the two earlier Italian cases. 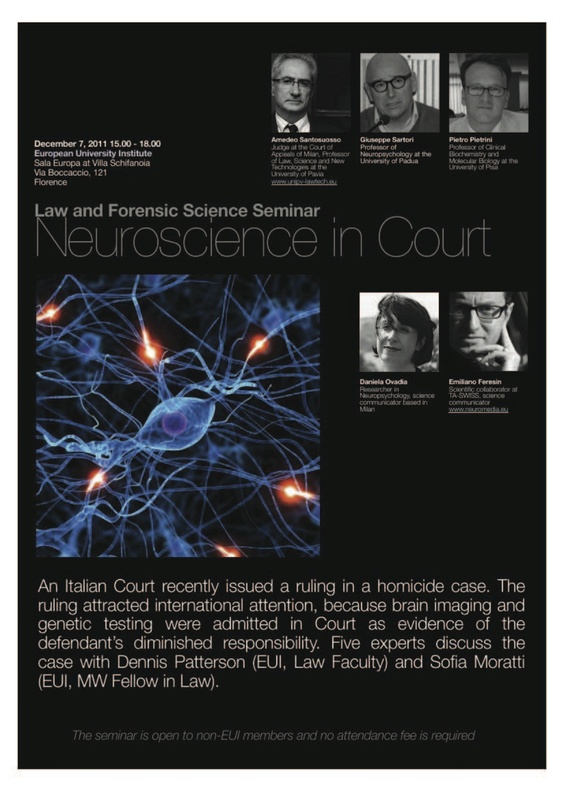 Finally, two science communicators, Daniela Ovadia, who is also a researcher in Neuropsychology, and Emiliano Feresin, scientific collaborator at TA-SWISS, will discuss the way the Como case was portrayed in the media and a number of problems related to social neuroscience and law and neuroscience. There’s a door opening wide into astrophysics, nanoscience and neuroscience, and science journalists can apply for front-row seats to cover a landmark event honouring researchers in these fields. The door is in Oslo, Norway, but it’s open for applications from science reporters anywhere – from Chile to China and all points in between. The $1 million Kavli Prize ceremony is scheduled for Oslo, Sept. 3–6, 2012. The Norwegian Academy of Science and Letters and The Norwegian Ministry of Research and Education are offering up to seven journalists transportation from their home countries, a week’s accommodation, and lectures by some of the world’s best popularizers of science. The World Federation of Science Journalists will choose the journalists on behalf of by the Norwegian ministry and academy and winners will be announced during the 2012 annual meeting of the American Association for the Advancement of Science, Feb. 16–20, in Vancouver, Canada. Scientists in the running for the $1 million Kavli prizes for 2012 will be chosen in May or June of next year by the Norwegian Academy of Science and Letters and will be presented by King Harald of Norway in September. The Kavli Prize is a partnership between The Kavli Foundation, The Norwegian Ministry of Education and Research and The Norwegian Academy of Science and Letters. The scholarships are funded by the Norwegian ministry and academy. The Kavli Foundation is the brainchild of Norwegian-born Fred Kavli, a physicist and entrepreneur who came to the United States after the Second World War and invented flight control sensors for aircraft, devices which operate in most commercial and military aircraft today. In a 2007 interview with actor Alan Alda on the foundation website http://www.kavlifoundation.org/fred-kavli, Kavli said that after he sold his business in 2000 he wanted to “do something of long-range benefit to human beings,” and do it in his chosen field of science, “especially physics.” (Alda, along with Åse Kleveland, former Norwegian culture minister, hosted the 2010 Kavli Awards ceremony.) For their founder, the Kavli Awards – in astrophysics, nanoscience and neuroscience – were defined to encompass everything “from the biggest, to the smallest, to the most complex” knowledge being pursued by researchers today. Applications should be emailed to WFSJ info@wfsj.org by Jan. 15, 2012. An application package should include the journalist’s CV and co-ordinates, identification pages from his or her passport, three articles or audio/video files on astrophysics, nanoscience or neuroscience (in the original language), and a one-page essay in English on why the applicant should win this competition.